Call us today at 480-837-9261 ! Fountain Hills Veterinary Hospital practices caring progressive medicine, and wants only the best for your pet. 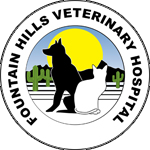 Fountain Hills Veterinary Hospital has provided compassionate veterinary care and pet services since 1984, making us the animal clinic of choice for pet owners in and around our community. Fountain Hills Veterinary Hospital is a full-service animal hospital and boarding facility whose mission is to provide the highest standard of veterinary care for your pets. We strive to provide professional, advanced veterinary services at affordable prices. At Fountain Hills Veterinary Hospital, you will walk into a calm, welcoming, and friendly environment every visit, so that the experience is as comfortable as possible for you and your pet. We offers emergency vet care during regular business hours, as well as medical, surgical, and dental services. We offer In house bloodwork, digital x-rays, ultrasound, and CO2 surgical laser in addition to the most important asset in our hospital (our staff!). If necessary for the health of your pet, we will assist you in scheduling a consultation with the best veterinary specialists. Dr. Patricia Kupanoff, a board certified veterinary surgeon, is on staff to perform surgical procedures as needed. This assures continuity of care for you and your friend. At our boarding facility, your pet will get individualized attention and a large clean run. All dogs are walked three times daily. Cats get playtime in our separate cat boarding room. If you are new to our website, please browse around to learn about our facility and to read interesting pet articles and watch pet videos. Click on the "email us" link below to ask us a question or to submit feedback. For directions to our office see our contact us page. To receive free monthly veterinary care articles, please subscribe to our newsletter. Remember, at Fountain Hills Veterinary Hospital, we offer the BEST care for your BEST friend! "Thank you for taking great care of Luna. I was so pleased by how everyone on staff gave her cuddles and love to make her feel comfortable." "I appreciated the time you spent getting to know my dog and thinking of ways to take care of her issues. Very caring staff"
"As always, we were very pleased with the care you gave our Bella...and will continue to recommend you!"